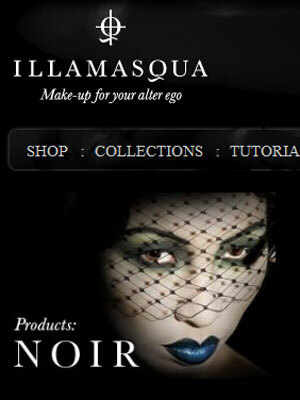 When I was browsing through the Illamasqua home page, I instantly feel in love with their next photo. I took the picture as an inspiration and I tried to do my version of the Illamasqua Noir look. Of course my version is nothing compared to what you see above. But you know I’m not a make up artist and my eyes are way different from the ones the beautiful model has. Well … at least I tried. I used tons of different things to create the look. Sorry, I can’t remember what I used, but I can tell you it was a lot. And there was a lot of blending involved. I know how important perfect eyebrows are, that’s why I tried really hard with them and I painted them very dark. I freaked out, when I looked in the mirror and saw almost black eyebrows. Unfortunately I didn’t have any false eyelashes at home, when I was creating the look. I know that false eyelashes are almost a must when you do such a dark and dramatic make up. Well, I have to buy some and learn how to use them. Which false eyelashes are your favourite and why? I would really love to know. The emu and the nails are awesome though I love the green emu much more. Damn, this is hot! You did a great job in recreating it!!! .-= Lyra´s last post … Essence: Into The Wild Trend Edition =-. .-= Mamy´s last post … Orly: Gumdrop and Snowcone from Sweet Collection and Mint Mojito =-. poleg tega pa sem vesela, da so k nohtkom dodane namazane očke, oz. obratno. .-= Maestra´s last post … Swatch and review: Illamasqua – Nudge nail polish =-. Očitno vas je Veruschka vse očarala. :nails: Lepa je res! Valjde, spet je treba vse pohvaliti. Ampak imam pa nekaj pripomb! Predivno :D obožavam zeleno na očima! .-= Dorotea´s last post … Review: Avon True Color Quad – Mocha Latte =-. Nična? Tvoja verzija je čudovita! .-= Gejba´s last post … China Glaze – Watermelon Rind + Essie MAY =-.